This article was originally published on the Conversation. An extended version of the post features in my book Britain’s Cold War: Culture, Modernity and the Soviet Threat, available for pre-order on Amazon. Read the original article. Football is not often linked to warfare, but as the 2018 World Cup begins in Russia – during what some political commentators have deemed a new Cold War – the mixing of people from all over the world will be part of a global governmental competition for prestige. It may not seem like the most straightforward tactic, but football’s ability to bring cultures together previously formed part of the British government’s waging of the original Cold War, in the 1950s. England’s assumed superiority at football meant that the football association did not enter FIFA’s World Cup until 1950. But in the first two tournaments the national team took part (1950 and 1954), they were rather uncompetitive. Worse, in 1953 the team suffered its first home defeat to a team from outside the British Isles, being crushed by Hungary’s “Magnificent Magyars”. The national game was in disarray with defeat to an iron curtain nation compounding the issue. Britain did have an ace up its sleeve, however. Many clubs organised exhibition matches against Soviet sides. In the same way that the World Cup provides a great opportunity for Valdimir Putin to showcase the best face of Russia now, so the mid-1950s allowed the post-Stalin Soviet leadership to tell the world that things had changed. What became known as “the thaw” – when the Soviets lessened censorship and repression and attempted to show the benefits that communism could bring – created new opportunities for clubs, and the national team to visit the turf of their ideological rivals. While sport appeared politically neutral, the government hoped to benefit from these visits. Prior to Arsenal’s 1954 visit to the Soviet Union, the British embassy advised that, “we should urge on the Football Association that they should send out a really first class team, ensure that they are in good condition and that they do not drink too much … This will, at least, ensure that we put up a credible performance”. Arsenal’s visit was seen as being of national importance, and the government acted to prevent defeat in the sporting arena. A British embassy “scout” even sent a report on the Moscow clubs tactics’ on the basis that “a few remarks … about the standard and tactics of the club teams they will meet may be of interest and of possible help to the British team”. However, even with the state’s advice, Arsenal lost their match to Moscow Dynamo, 5-0 – a “massacre”, according to the Mirror and Express newspapers – before losing 2-1 to Spartak Moscow in London in November 1954. The limited encounters available to Britons were often regulated by their own government and the Soviet state but they still played a broader role in waging the cultural cold war. The next year, the Wolverhampton Wanderers, who were first division champions in 1954 and finished second in 1955, visited the USSR. They took around 100 supporters to Moscow with them, along with both print and broadcast journalists. Though newsreels showed Wolves losing 3-0 to Spartak Moscow, and 3-2 to Moscow Dynamo, a more revealing clip introduced Moscow itself. As Russia will this year, the USSR presented its best face. When the team visited the Kremlin the Pathé voiceover noted that their cameraman was “the first British newsreel man to be allowed inside its towering walls”. Shots of a giant cannon, Red Square and the mausoleums of Lenin and Stalin completed the tourist iconography of communist Moscow. Outside Lenin’s tomb, British viewers were given a rare glimpse of the Soviet population including “farmers from Kazakhstan and Mongolia”, which helped to reinforce a sense of difference between Britain and the USSR. The commentary concluded with “Surely the iron curtain is melting away at last; may it never return”. These images of Moscow raised hopes of better relations with the USSR and the possibility of an end to the Cold War. Individual contacts warmed relations, even if the British teams’ failings suggested the communists were ahead in sporting prowess. And so it was left to the national side to redress the balance. By 1958, following the Soviet suppression of the Hungarian uprising and the deepening Berlin Crisis, the thaw was over. That year England took on the USSR four times. Holiday company Morlands even offered supporters “a special cruise with five days in the USSR to see the international football match in Moscow”. Draws in that friendly, and the group stages of the World Cup in Sweden were compounded when the Soviets won a play-off to send England out. Cold War sporting parity was restored, however, when the English won an autumn friendly 5-0 – described by the Daily Express as being “hammered and sickled”, with suggestions that Russian players would now be forced to work in salt mines. As the Cold War re-froze the conflict trickled into the sports reports. While football became a proxy for the Cold War in the 1950s it also allowed sports fans to learn about the enigmatic country behind the iron curtain. As Britain’s global position is once more changing, and Russia is portrayed as posing a direct threat, more understanding between the respective countries might lead politicians to question how to approach international diplomacy as people from different cultures mix. Sitting on a train pulled into the station I notice massive Billboards for John Le Carre’s A Legacy of Spies. The novel will become one of the best sellers of 2017 and will add to Le Carre’s oeuvre of exciting spy thrillers that many attempted to imitate; although none have come close to the drama and literary quality. His new book engages with themes of the reliability of historical sources and may well become known as Le Carre’s ‘History Novel’. History is a vital part of the storyline with the past catching up with one of Le Carre’s earliest creations, Peter Guillam, who had featured in the previous Smiley novels as a supporting character. Now, however, the retired spymaster is the centre of the plot. Guillam is the subject of a Circus enquiry into the actions of the Covert department, headed by Smiley over 50 years ago, after the descendants of Alec Leamass and Liz Gold (who met their deaths in Le Carre’s breakthrough The Spy Who Came in From the Cold) bring legal action against the service. The novel takes place simultaneously in the present and the early 1960s and directly compares the current security service with its Cold War incarnation. Both versions of the Service are ruthless and act with self-interest whilst creating scapegoats – including its former staff like Guillam – who is used to deflect the legal attention. A central feature of Le Carre’s novels is the conflict within the secret service; but whereas in the past he has pitted Smiley and co against internal traitors A Legacy of Spies pits the new ‘Circus’, which Guillam finds faceless and lacking in character and morals, against the old version that was beloved of the original Smiley series. The novel’s narrative weaves the present with history. Peter is asked to read the official MI6 documentation and this jogs his memory into a number of internal reminisces about the events of the past. The official record is faulty with events omitted, made up or altered in order to protect the service’s agents from such future litigation and to prevent the Soviet double agents from betraying the spy networks to Moscow. The version of history emerging from the paper trail that the bureaucracy of espionage created and sought to protect from enemy spies cannot be trusted and it now needs protecting from the service itself. The official record is contradicted by Guillam’s memory and what he is willing to reveal to his interrogators. Making sense of all this are the service’s lawyers and a section who are charged with recreating the past who explain that ‘we are history’. All of the sources are ultimately faulty: the doctored records; Peter’s aging memory, which perhaps embellishes his exploits and makes them seem much more daring and overtly ‘masculine’ than they actually were, and the untruths and half-truths that he tells interviewers in order to protect the truth. Like all history the one that the History Section of the Service produces does not reveal the truth but is a narrative which is shaped by those able to find a voice in writing the documents and in shaping the official memory of the actions of its agents over 50 years ago. A Legacy of Spies should remind historians to be wary of ‘official’ histories and the ‘official record’. A new book series seeks to generate new insights into the connections between espionage and culture. During the second half of the twentieth century the public became aware of the importance of the role of espionage and security services. Television, radio and print news reported shocking events including the defection of Soviet moles like Kim Philby, Guy Burgess and Donald McLean; the Profumo scandal of 1963 that exploded when the British Secretary of State for War, John Profumo, had an affair with a woman who was in contact with the Soviet security services; and the state censorship of Peter Wright’s memoir Spycatcher (1987). Whilst the news sparked the public interest popular culture soon followed and the 1950s and 60s saw the resurgence of spy books, films and television series. The James Bond franchise of books and films began in 1953 with the publication of the book Casino Royal. Bond achieved mass popularity in 1962 with the cinematic release of Dr No. Over the coming decades twelve authors have written James Bond novels or shorts stories and he has been played by seven actors with the books and films enjoyed by millions. Other authors such as John le Carré and Len Deighton released bestsellers which were adapted for film and television and brought an often more realistic version of spying to an international public. Jointly edited by Dr Nicholas Barnett, Lecturer in Twentieth Century European History at Swansea University and Dr Laura Crossley, Lecturer in Film at Bournemouth University, ‘Routledge Studies in Espionage and Culture’ is a major new books series which seeks to investigate representations of the intelligence world and how we interact with it. The scope of the series is international and it seeks to blend several disciplines including cultural studies, history, literature and film studies. Books published in the series will investigate topics including: the spy novel, films, television shows, documentaries, games, music, fashion and materiality. Whilst books on the representation of intelligence agencies in popular culture are welcome the editors also welcome contributions which investigate political cultures and the everyday lives within the organisations themselves as well as wider considerations of surveillance culture. Scholars have long been interested in the representation of spies and spying and this series seeks to establish itself as one of the key outlets for continuing that scholarly conversation. Where possible the monographs and collections of essays will be include comparative international studies but submissions will also be welcomed which examine significant national cultures. The series does not seek to limit itself to any particular time period and will publish accounts of both historic and contemporary espionage and culture. Each book will feature a unique introduction written by the series editors. Here is the order of events for the Spies on British screens conference. Places can be booked here (early bird before 16th May 2016). The organisers were really happy with the quality of abstracts and look forward to a stimulating conference. Maria Vaz (Lisbon University Institute) – The James Bond effect: 50 years of a global phenomenon evolution. Caterina Foa – (Lisbon University Institute) The James Bond effect: 50 years of a global phenomenon evolution. Filipa Moreira – (Lisbon University Institute) The James Bond effect: 50 years of a global phenomenon evolution. Claudia Sternberg (University of Leeds) – Beyond the Western Front: WWI Screen Espionage as Female Empowerment? Catherine Edwards – “Right. We shall start.” Narrative beginnings in adaptations of John Le Carré. Toby Manning (The Open University)- The Special Relationship: how US espionage drama Homeland channels John le Carré. Tom May (Newcastle) – Not so ‘Special’ a Relationship? Intelligence and Cold War geopolitical history in adaptations of Graham Greene’s The Comedians and The Honorary Consul. Cat Mahoney (Northumbria University) [Peggy punches him in the face]: Marvel’s Agent Carter, a New Popular Feminist (?) Hero. Kirsten Smith (Lancaster University) From Mundt to Martin: the development of East German masculinity on British screens. Proposals are invited for a conference which will explore the continued popularity of spy and intelligence thriller on British cinema and TV screens as well as offering new interpretations of previous aspects of the genre. Taking place at Plymouth University from 17th-19th June 2016, panels will discuss the genre, its origins and evolution. Discussions can also consider how our expectations/ideas of real-life surveillance culture are shaped by screen representations. The Organisers are currently negotiating the possibility of linking scholarly publications to the conference and it is anticipated that selected papers will be published in a journal. Keynote Speaker: Dr. Pamela Church-Gibson (Reader in Cultural & Historical Studies, UAL) There will be a wine reception on 17 th June and the Conference meal on 18th June will take place at the River Cottage in the historic Royal William Yard. Panel proposals or individual papers of up to 20 minutes length are welcome. Proposals are invited for a conference which will explore the continued popularity of Spy and intelligence thriller on British cinema and TV screens as well as offering new interpretations of previous aspects of the genre. Taking place at Plymouth University from 17th-19th June 2016, multiple panels will discuss the genre, its origins and evolution. Discussions can also consider how our expectations/ideas of real-life surveillance culture are shaped by screen representations. The Organisers are currently negotiating the possibility of linking scholarly publications to the conference and it is anticipated that selected papers will be published in a journal and/or edited collection. The intelligence community has captured the imagination of many British people throughout the twentieth century. Many members of the British population have gained their entire knowledge of the intelligence and the secret state through the spy film or TV programme. With popular films such as SPECTRE (2015) depicting a modern interpretation of intelligence or dramas such as The Game (2014) offering cold war nostalgia it is clear the Spy remains as popular as ever on British cinema and TV screens. ‘Historians are the most powerful and dangerous members of any society. They must be watched carefully… They can spoil everything’, was the (possibly apocryphal) view of Soviet Premier Nikita Khrushchev. The last few years seem to suggest that both sides in the cold war took Khrushchev’s warnings seriously. Last year the national archives released the security files of some of the Communist Party Historians Group including Eric Hobsbawm, Christopher Hill and John Saville, whilst last month it came to light that Sir Martin Gilbert had met with the Hungarian secret service who had attempted to recruit him. It might seem odd to many that historians would draw the attention of security services but the nature of the cold war meant that history became a battlefield of ideology that was of vital interest to all involved. The British state’s observation of historians shows the level of paranoia that the cold war created. Whilst the Communist Party was a subversive group who acted under the influence of Britain’s cold war enemy, we should consider that British values exalt the freedoms of belief and association. Both of these principles are challenged by an almost continuous state of observation that was applied to potential subversives during the cold war, and which is currently being universally expanded. Many of the documents relate to the direction of the Historians Group following the turmoil of 1956 which led to the creation of the new left and Evan Smith has blogged on the subject. I’m struck by the extent of observation that the British state kept potentially subversive historians under. Like many communists Hobsbawm routinely had his mail opened and telephone calls were tapped. Much of the information was destroyed after a few weeks and only that which was deemed of importance to state security was left on file. Hobsbawm still managed to fill 8 sizable files and some of these have been digitised. One of the telephone intercepts says ‘Eric was in Cambridge and was calling to see if he might come round after supper. Alan [?] invited him to come and eat something with them but Eric preferred to come later – he mentioned he was just going into Hall for his meal’ (27/11/59). An innocuous statement at first, but when I mentioned this to a colleague he suddenly brightened up and told me that Hobsbawm and the others would have known that they were being spied on and did things like this to confuse MI5. So perhaps the quarry did all he could to avoid the huntsman. Gilbert’s case was somewhat different. The biographer of Winston Churchill later became part of the British establishment rather than an intellectual renegade like Hobsbawm. Of course, this would not necessarily make him less prone to spying for the East. The approach from Hungarian secret services came whilst Gilbert was an undergraduate. Like many Western scholars who had an interest in and visited Eastern Europe his potential future influence might have been beneficial to foreign security services. Gilbert –either wittingly or unwittingly – met with Hungarian agents several times in both Budapest and London who lavished him with hospitality. Perhaps it was Gilbert’s claim to have been involved with CND, or other left-wing dressing that attracted his suitors. Then again the New Statesman suggests that Gilbert knew exactly what was going on and soaked up the hospitality whilst leading the Hungarians in a merry dance. 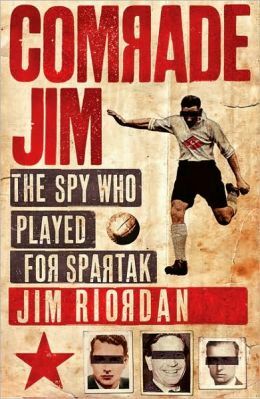 One further historian, who never attained the fame of Hobsbawm et al, but who certainly had worked for British security services before becoming a communist was the sports historian and novelist Jim Riordan. Riordan’s biography Comrade Jim (Harper, 2009) is a fantastic read, although I am sceptical about some of his claims. On national service he served in Berlin listening to intercepts of the Soviet wires before moving to Moscow as a committed communist. Riordan quickly became disillusioned with life under communism and worked translating books into Russian. His biography reveals that he met several former spies and continued to hone his football skills with the British residents team in Moscow. One of Riordan’s stranger claims is that he played several games in defence for Spartak Moscow. Riordan had always been a keen footballer and trained with the team. Riordan claims to have played twice for an injury hit Spartak, under the Russified psuedonym Eeordahnov. By all accounts he lacked the fitness of the pros and could not handle the speed of the opposition strikers. But Riordan’s is a great story nonetheless. Whilst in Moscow Riordan mixed with several members of the Cambridge five. He remembers several cricket games organised by Donald Mclean whose public-school Englishness clearly stuck with him following his defection to Moscow. Mclean organised a match amongst defectors, translators and a Daily Worker correspondent. The match was umpired by another Cambridge spy, Guy Burgess, and supported by the British community in Moscow who apparently did their best to turn it into a kind of country fete. Mclean scored 15 and Riordan was out for a duck. When Burgess died aged 52 in 1963 Riordan acted as pallbearer at his funeral. He recalls inviting Mclean over to dinner. Whilst he describes him as ‘perfect gentleman’ it seems Mclean was a poor drunk who turned nasty during the cheese course. He describes the Cambridge spies as committed to Marxism, whilst his own commitment wavered having experienced the reality. Riordan returned to Britain in 1965 to complete his PhD studies and was promptly expelled from his local Communist Party branch for his reformist tendencies. He was able to find academic work in Bradford. What connects the three cases above is history and ideology. Whilst Hobsbawm and Riordan were, at some point, committed Marxsists, GIlbert was not. But that did not stop the communists trying to recruit him. Perhaps the analytical mind draws the association between historians and communism, or the high boredom threashold that allows them to continue examining document after document when others might stop. I think that most of all, however, we should consider their ideological role in shaping and reshaping national and international narratives. Khrushchev thought historians were dangerous for the same reasons that George Orwell did in his celebrated novel 1984: they had the ability to influence how people thought about their nation. That is why MI5 spied on Hobsbawm et al, it is also why the Hungarians attempted to discover where Gilbert’s loyalties lay. Watching the first three episodes of The Game (dir: Toby Whithouse) viewers are transported back to an era of security that is reinforced by the cold war. The enemy is clear: The Soviet Union and they act predictably: by trying to undermine Britain and by evading its security services. In many ways this drama could have been written in the 1970s and the resemblance to both the original and more recent screen representations of John Le Carre’s work is stark. 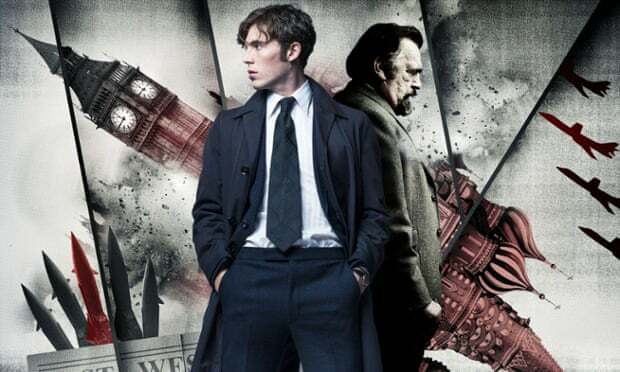 The difference, however, comes in the narrative perspective: whereas Le Carre’s protagonists tended to be the older members of the British security services – the George Smiley type – who plan and seek out the internal betrayal, The Game tends to focus on the youthful Joe Lambe (Tom Hughes) – a detached killer who for works for his country only so that he can pursue his own personal vendetta. The result is a faster paced thriller which still explores the contradictions and inter-service rivalry, which are interlaced with sexual and class politics, but which produces tensions which grip the viewer from start to finish. The plot is an attempt by MI5 to uncover a Russian plan called ‘Operation Glass’. The deserter, Arkady, has revealed that this operation will change the face of intelligence work and the service must work out what the Russians plan. They have little idea and at first they think the Russians intend to arm the trade unions who are already waging a war against the British government. By the second episode, when a soviet agent tortures the Prime Minister’s secretary to reveal the contents of the Letters of last resort, given to nuclear submarine captains, their intuition turns towards the idea that ‘Operation Glass’ is a pre-emptive nuclear strike. This idea too is quickly dispensed with and by episode three it seems that the plan is to make the various British services consume each other, when an MI6 agent being framed by the Soviets. 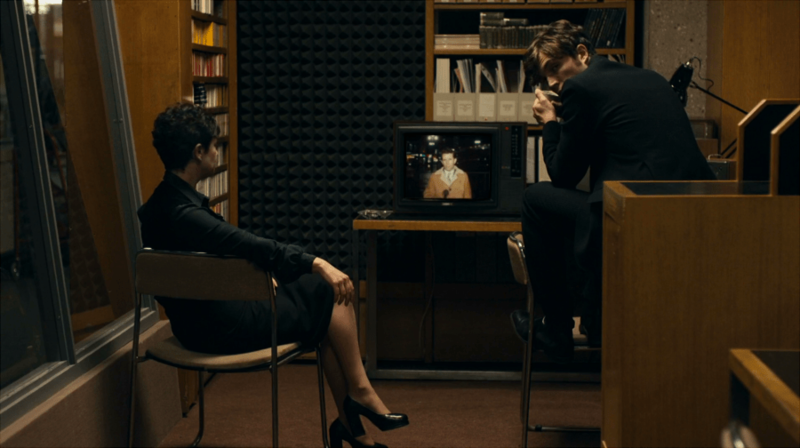 Suspicion permeates the series and the idea of a mole in who must be rooted out frames the series. The plot takes place within the 1974 miners’ strike, which led to the three-day week, and ultimately defeated Heath’s Tory government. Power cuts intersperse the action and add tension, making the chiaroscuro shots darker than noir. There might, however, be a little too much signposting for a non-historical audience: shortly after the lights go out in episode three Sarah (Victoria Hamilton) comments ‘at least these power cuts make tailing easier’. Joe Lamb is a contradictory character whose realpolitik means that endangering lives to serve the greater good is an everyday occurrence. He manipulates his agents to get them to serve the country. When he forces the reluctant Soviet agent, David to entrap the Russians in episode one he tells him ‘this is an opportunity not just to repay your debt but be a hero, a soldier, to fight for something greater than us’, the same line he had given to his lover, Yulia, whose murder caused his own vendetta against the Russian agent ‘Odin’. The line is the kiss of death and like Yulia, David is promptly killed by Odin. Yet it is a line that raises questions of patriotism and service to Britain. This attitude underpins all that MI5 do. As the head of service ‘Daddy’ (Brian Cox) tells his agents ‘We endanger the few to protect the many’. Throughout the series, viewers question stereotypical presentations of gender. Joe appears as a hypermasculine character: assertive yet emotionally distant ever since the murder of Yulia. He is somewhat flawed as a man but these flaws make him the efficient spy that he is. Sarah Montag is a strong female whose husband Alan (Jonathan Aris) claims is ‘destined for greater things’. His role as field sound expert means that he is the kind of aloof scientific expert. In episode one he has a list of ‘small talk’ topics written to break up the unbearable silences. Alan’s social awkwardness comes to fore when, ahead of David’s meeting with the Russian agent, he asks Joe if they have a coffin for David’s dead body. When this clearly makes David even more nervous Alan says ‘humour to lighten the mood’. Another item scratched off his list. Sarah is protective of Alan and when he is bullied by a public-school-type civil servant it is Sarah who has the confidence to challenge him. The Head of Counter-espionage, Bobby Waterhouse (Paul Ritter) appears untrustworthy and the series makers have this trait underpinned by his apparent hidden homosexuality. He hides his sexuality from his colleagues and lives with his mother, who appears to hate what she sees as his failure. His secret allows him to be dominated by those who find out. Wendy, ‘Daddy’’s secretary, who appears insecure, yet determined to succeed in her own career, becomes suddenly confident in his presence. How this will play out in the remaining three episodes remains to be seen. Underpinning the whole series is the security of a normal enemy. In episode one Sarah sums up the intelligence war ‘It is a war of variables and unknowns and all we can do is watch, surmise and react’. Yet these variables and unknowns provide comfort in the 2010s when the threat is the home-grown fundamentalist terrorist. At the very least the Soviet’s intensions appear clear and their agents are predictable, if only in their unpredictability. The ‘Game’ itself is a metaphor that implies that there are rules and a set way of playing. Such a contrast with today’s ‘enemies’ is striking, and the series nostalgically evokes cold war insecurity. The series so far is exciting and tense. Having missed the first three episodes I watched them all back to back. Intelligence work is presented as more realistic than in James Bond films but it lacks the bureaucratic plodding realism of a John Le Carre. I for one can’t wait for the next three episodes. Culture and ideology have gained more and more attention in recent Cold War historiography. New emphasis has been placed on the role of ideas and language, as well as on the agency of specific individual and collective actors. The two-day conference at SciencesPo in Paris (November 26-27, 2015) will focus on the personal paths of a number of political, intellectual and institutional protagonists of the cultural struggle between the two blocs. Their common denominator, far from being defined by geography or profession, will lay in their willingness to engage with the ideological context of the Cold War – and in their ability to shape it. We invite proposals of 250-300 words from young researchers (PhD students, post doctorate and early career researchers). We particularly welcome transnational and interdisciplinary perspectives. Full papers shall be submitted in English and they will be circulated in advance. Deadline: May 31, 2015. For most of the second part of the twentieth century, geopolitical issues remained at the center of the historiographical debate on the Cold War. Culture and ideology, however, have gained more and more attention in recent historiography. New emphasis has been placed on the role of ideas and language, as well as on the agency of specific individual and collective actors. In this perspective, the concept of the Cold Warrior appears crucial. Generally used to refer to governments’ officials who were directly involved in the policymaking process, the notion expands here to encompass all those thinkers actively engaged in the definition of the nature of the bipolar struggle and the means necessary to wage it. At the same time products and agents of decades of divisive experiences of politics, they built antithetical, antagonistic, and more or less belligerent Weltanschauungen, often acting as cultural avant-garde of the West-East confrontation. Their role was twofold: on the one hand, they had to define a common image of the enemy; on the other, they had to construct their own side’s self-representation and self-legitimation. Although this kind of historical analysis remains defined by the chronological boundaries of the Cold War, the study of these ‘embedded’ ideologists could be inserted in a broader temporal dimension, as the confrontational dynamics that they contributed to set in motion and the discursive categories they produced transcend traditional categorizations. The two-day conference will focus on the personal paths of a number of political, intellectual and institutional protagonists of the cultural struggle between the two blocs. Their common denominator, far from being defined by geography or profession, will lay in their willingness to engage with the ideological context of the Cold War – and in their ability to shape it. An important theme will thus remain the analysis of the relationship between the intellectual and political power. The conference will bring together different case studies and interpretations from both sides of the Iron Curtain, seeking possible syntheses and new interpretations. Critiques of bipolarism, and the elaboration of non-aligned or neutral positions will also be taken into account. We invite proposals of 250-300 words from young researchers (PhD students, post doctorate and early career researchers). We particularly welcome transnational and interdisciplinary perspectives. Selected proposals will be divided into three panels with commentary throughout the two days. Full papers shall be submitted in English and they will be circulated in advance. A cocktail reception in the first evening and a light lunch in the second day will be offered to the participants. Depending of the funds available, some reimbursements for the expenses could also be provided. The exhibition ‘Work and Play Behind the Iron Curtain’ opens at London’s Gallery for Russian Arts and Design on 20th June 2014. It explores the design of everyday objects from the Soviet Union in the 1950s and 60s. The exhibition’s staging in London remembers one of the ways in which the British engaged with the Cold War and a fascination with the Soviet Union that often went beyond simple Cold War division. 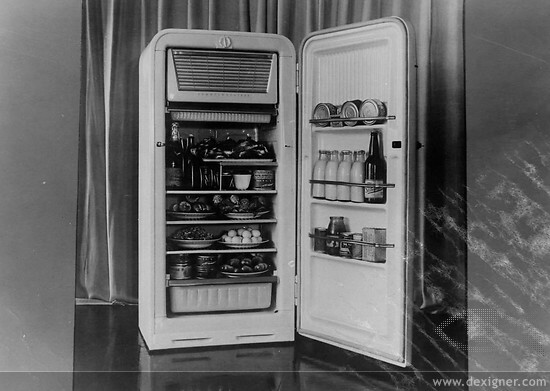 During the Cold War London hosted three Soviet exhibitions at which the Russians showcased their latest consumer goods and technological inventions from fashion and food to Sputniks. Verity Clarkson has examined the impact of these events in her chapter in Anthony Cross’s collection A People Passing Rude. The exhibitions began as part of period cultural exchange during which time teh Soviet leader, Nikita Khrushchev, sought to demonstrate that the Soviet system would bring greater prosperity to the masses than capitalism and that history was on their side. The most famous example of this consumerist confrontation was when Khrushchev and America’s Vice President Nixon became embroiled in a heated argument during the opening of America’s trade fair in Moscow in 1959 in what has now become know as the kitchen debate. When it came to Britain, however, events were never quite so heated and when he toured Britain’s trade fair in 1961 Khrushchev was careful to point out his desire for friendly relations with Britain and his thankfulness that the UK lacked the arrogance of the American’s who had been accused of engaging in liquid propaganda by distributing fee Pepsi Cola to Soviet visitors. Many of the British Correspondents, not least the Guardian’s John Cole used their coverage of the British trade fair to explore life in Russia. Cole looked at questions like freedom of religion and how British workman had narrowly avoided a strike by the timely arrival of a consignment of cigarettes from back home. He also expressed his bemusement that he was able to openly watch a jazz session ‘that would have rivalled New Orleans’. At the return event at Earls court in July 1961 the Soviets displayed their latest fashions and several newspapers including the Daily Mail expressed surprise that the ‘seven cute comrades’ who come to model clothes didn’t conform to the common stereotype ‘that all Russian women are dumpy, dowdy and dull’. Misogynistic as comments like these were, perhaps they reveal a desire to go beyond the Cold War and to know the Soviet Union. Certainly headlines that later emerged from the Mail tended to lessen the Cold War enmity by declaring ‘They Are People’. The visit also coincided with Yuri Gagarin’s flight into space and the Soviet’s sought to maximise the publicity around both events by having him visit the exhibition. Everywhere that Gagarin went he was greeted like a pop-star and he drew increased attention when he attended meals with the Prime Minister Harold Macmillan and the Queen. Gagarin’s visit helped to increase interest in the exhibition and over 20 days it drew over 600,000 visitors with John Paget, the 250,000th visitor being presented with a vodka prize on 18th July. The popularity of Gagarin amongst the British drew criticism from some Americans with Drew Middleton of the New York Times complaining that the celebrations stemmed from the fact that he was not an American. Whilst many British people were happy to look beyond the Cold War and celebrate a great human achievement the conflict loomed in the background and was entering its most dangerous phase, a point of which Middleton amongst others was happy to remind the British. Both the 1961 and 2014 exhibits reveal the consumerist dreams of the Soviet Union during the period when its leadership were at their most optimistic of delivering their utopia. Ultimately many of the goods on show were more utilitarian than most British people desired and they certainly lacked the refinement that people in metropolitan areas like London were increasingly demanding by the early 1960s. The popularity of both the 1961 exhibition and Gagarin’s visit reveal that the Russian population was treated by press and many members of the British as part of a common humanity whose interest was best served by peace and by knowing each other. These desires deviated from the increasingly fraught international situation which was drvien by both the nuclear arms race and the unfolding crisis in Berlin.